MANILA, Philippines - The official results, list of passers, top examinees and other important announcements for August 2017 Civil Service Exam - Pen and Paper Test (CSE-PPT) both for professional and subprofessional levels are released by the Civil Service Commission (CSC) within forty one (41) days after the eligibility examinations. 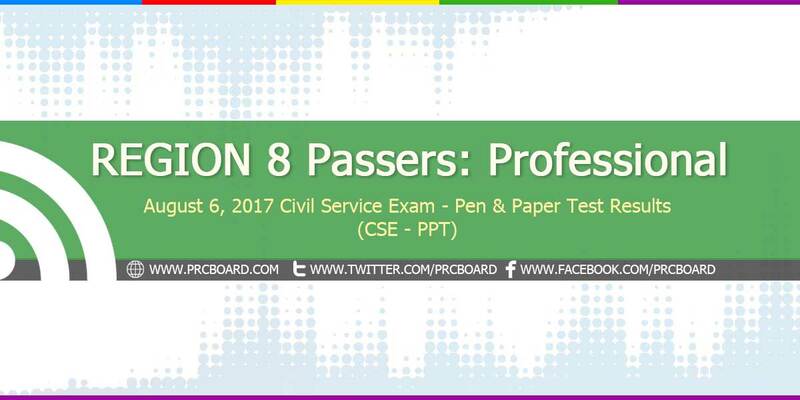 Below is the complete list of passers for August 2017 CSE-PPT Professional Level in Region 8 (Eastern Visayas). ZAMORAS, ROSEMARIE P CSE-PPT (Professional and SubProfessional) are eligibility exams conducted by CSC twice a year to cater the growing number of individuals who wish to serve in Philippine government. ano po ba name mo? kailan po ba e post ang top10 ng csc prof. ? congrats to all the passers. Those who were not able to make it, God will bless you next time. Nakalimutan ko po Examination No. ko, tapos may page kayo na pwd malaman ulit un, pero 10x na ko nagtry, di raw mahanap Name ko. Bakit po ganun?